There is a reason why several cops are trying to get their hands at this blend. 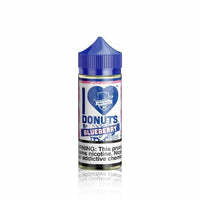 Blueberry is the name of the succulent e liquid that is going to be flavorful and make you feel as if you are hanging out at some kind of donut factory tasting the fresh products being made. When you take the first pull, you are going to savor the delicious blueberries making their way into your mouth. The blueberries are going to be juicy and sweet as if they were correctly picked once they were ripe. Your mouth might even pucker for a bit because of the entire sweet goodness scattering around your palate. However, you are going to get the donut flavor just melting on top of your taste buds so that you can feel as if you are helping yourself to a pastry like no other. This blueberry donut is going to taste like donut you may have never even heard of in a donut shop or a pastry spot before. This blend is even going to develop a creamy sensation that is going to make it easy for it to continue to go down your throat. There is going to be a tiny throat hit, but it is not going to be too intense. This is perfect because it allows the flavor to get better the longer you hold this in. It might even make your mouth water for a while as the e liquid just explodes in your mouth. When you think you are done, you slowly exhale and allow the e liquid to take its times saying goodbye. The last few notes that this blend has to offer land on your tongue and you appreciate the effort to tease you a little bit. The clouds finally escape and the aromatic scent leaves you speechless. The only thing you want to do now is to take another pull that is going to be just as delicious as the first. I Love Donuts Blueberry - Mad Hatter Juice has a rating of 3.7 stars based on 3 reviews.